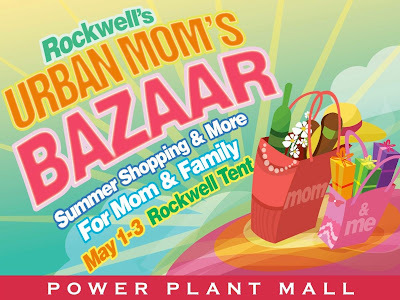 • enjoy up to 70% off on shoes and apparel from skechers, ecko unlimited, merrell, pony, and no fear at tektite, ortigas center on may 4-8, 2009 from 9am-8pm. see you there! • luxury sale at the palms, alabang -- one day only -- on may 7, thursday from 12-8pm at the daintree room. factory prices for high fashion pieces by natori black label, natori white label, josie, cruz, and natori! up to 70% off on fragrances by calvin klein, davidoff, bulgari, issey miyake, YSL, guerlain, ferragamo, vera wang, burberry, and a lot more! no invite, no entry! see you! 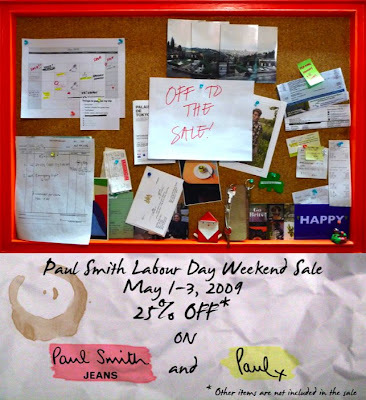 • from the paul smith mobile: labor day sale! Jeans line and paul x gets 25% off. 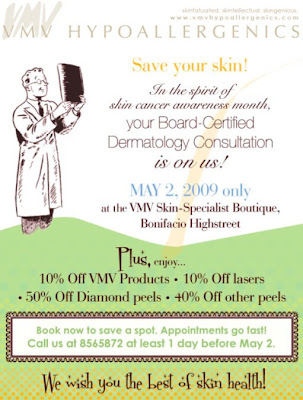 Sale runs from may 1-3. for inquiries you may reach us at shangri-la: 636-0488 and greenbelt 5: 729-9898. cheers! • labor day sale may 1-3 at benefits style salon greenhills branch! 20% to 50% off selected kerastase, l’oreal, MAC, benefit cosmetic, japonesque, and other brands. Please call 0918-888-7288 for more info. • Denim fanatics and enthusiast, we are turning you on!!! 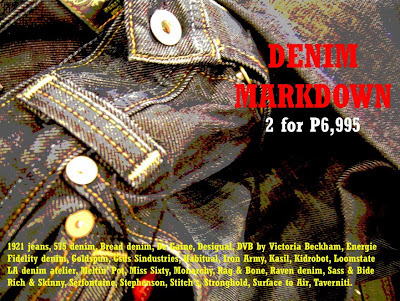 Theodore's the Store brings the latest offering on Denim, 2 pairs of jeans for the price of P6,995.00, starts on May 1, 2009, Friday. You're sure to find the perfect pair times two. with over 29 brands to choose from: 1921 jeans, 575 denim, Bread denim, De Gaine, Desigual, DVB by Victoria Beckham, Energie, Fidelity denim, Goldspun, Gsus Sindustries, Habitual, Iron Army, Kasil, Kidrobot, LA Denim Atelier, Loomstate, Meltin’ Pot, Miss Sixty, Monarchy, Rag & Bone, Raven denim, Rich & Skinny, Sass & Bide, Serfontaine, Stephenson, Stitch’s, Stronghold, Surface to Air & Taverniti. hi! i'd like to invite you to my garage sale. we'll be selling alot of unworn clothes (mostly from my zara), shoes, bags and etc. we'll also be selling baked goodies for mother's day and other dishes that will serve as a means to introducing our soon-to-open restaurant, kusina teatro. hopefully, you could drop by! How do you get invites to the Alabang sale? Is Paul Smith in Greenbelt?